The fourth in the Hattie Davish mystery series, A DECEPTIVE HOMECOMING, is scheduled for release July 28 -- just in time to slip it into the summer reading stack. Here's a well-written "traditional" mystery with intriguing setting, likeable amateur sleuth, and neatly chosen plot twists that keep the solution to Hattie's murderous puzzle out of reach until the final chapters. Hattie Davish is a professional private secretary -- her typewriter and her shorthand skills are less important in the long run than her discretion and absolute loyalty to her employer. 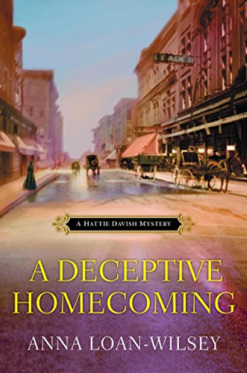 In the first three books of this series (A Lack of Temperance, Anything But Civil, A Sense of Entitlement), Hattie's embrace of this profession has set her aside as an unusual woman in the 1890s: one who is confident in her value and willing to take risks to protect her employer's life or reputation. Thus, Anna Loan-Wilsey brings us an "amateur sleuth" whose motives for investigating crimes (or even just extreme social disgrace!) are strong and compelling on behalf of the wealthy persons who pay for her services. Ginny didn't show any visible signs [of sorrow] that I recognized: red-rimmed, puffy sad eyes, and bowed, trembling shoulders. [Instead,] Her countenance bore deep-seated dismay or displeasure and not grief. She hadn't even been holding a handkerchief. The Ginny I knew would've been inconsolable, not simply put out. Had she changed that much in the time that I was gone? For Hattie, being on hand for her friend was reasonable, despite the trip of halfway across the country from home. "When I'd learned of her father's sudden death, I didn't hesitate to attend the funeral and do whatever I could to ease her pain." But chapter 1 ends with Hattie's remarkable statement: "Now, after seeing the wrong body in the coffin, I wish I had never come." There's much more wrong that a misidentified death in St. Joseph. Hattie's former teachers recruit her to visit the students and set an example for them -- everyone knows something about her recent investigative adventures! -- and almost immediately, she learns the school is in chaos: financial troubles that may involve fraudulent bookkeeping, damaged textbooks, distressed staff members and overexcited students. The unanticipated reappearance of Hattie's suitor from her student years unsettles things further, but Hattie isn't just independent: indomitable and determined are traits she embraces. Even insisting that the rather frightening staff of the local State Lunatic Asylum allow her to look inside is something Hattie can handle, though her own past makes the experience doubly frightening for her. Loan-Wilsey threads gentle humor into the suspense, without ever diminishing Hattie's dedication to truth and justice. Like her earlier books, this one is an enjoyable, satisfying read, meeting all the best expectations for a traditional mystery: red herrings, mixed motives, characters who have secrets (and what about Hattie's own?). No need to read the others first, though -- the books are nicely independent (like Hattie! ), and although they are clearly well researched, the history never gets in the way of Loan-Wilsey's best skill: spinning a good story with ample rewards in the reading. AFTER THE STORM is the seventh investigation featuring Kate Burkholder, chief of police in the part-Amish community of Painters Mill. 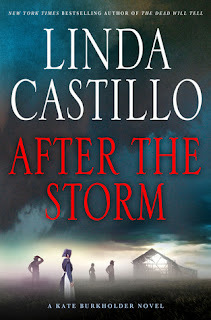 Linda Castillo's writing is so strong, her books so compelling, that I was startled last month to discover that many people don't yet know the series. I posted a review of the third one (click here) a few years ago; at this point in the series, Kate is secure in her job and cautiously enjoying a steady (if somewhat undefined) romantic and very loving relationship with State Agent John Tomasetti. Castillo has led Kate through the frictions and losses of her own Amish past, her departure from her culture and family (although she still has some connections, which become important here), and her choices in how to police a community where many people think they "know her" -- and don't. Into this settled situation comes chaos: in the form of a tornado, a personal issue that threatens what Kate and Tomasetti have been building, and the discovery of a body ... an Mennonite death with Amish connections that will take Kate back onto challenging turf with various segments of the community. I squat beside [the coroner]. "Doc, it looks like pieces of a garbage bag." He tosses me a knowing look. "That doesn't bode well for whatever happened to this individual." Uneasy questions pry into my brain. Did this person suffer some kind of fall and die? Was he crawling around under the old barn and got stuck? Was he working down here and suffered a heart attack? Or did someone murder him, place his body in a garbage bag, and dump it? I think about the scarcity of bones, and something dark nudges my brain. Castillo's writing is rich with imagery and character, along with affection. Losses in Kate Burkholder's life and community come with full emotional depth; gains are hard-earned and worthwhile. 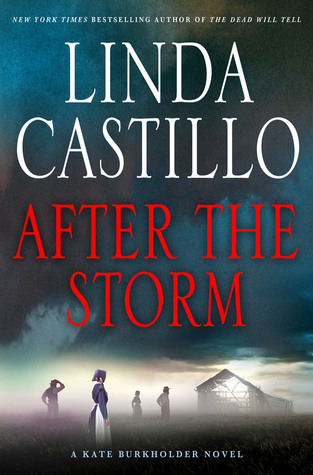 In other words, once again, Castillo provides a deeply satisfying book, framed in well-turned mystery traditions and made meaningful by the power of the lives revealed. You don't need to read the others first -- and in fact, Castillo's books are so strong and vivid that I'd recommend NOT reading one after another. Space them out, if you haven't yet tried them. And let me know what you think of this latest. I'd say it's a keeper. Summer has settled around us, warm and humid, with lush gardens and the hum of lawnmowers, sometimes a tractor. The pond on the ridge is quiet. The blackbird babies have left the nest and their parents no longer shriek when I walk toward the willow thicket along the shore. Even the frogs have turned lazy and replete -- the peepfrogs don't need to issue mating calls any longer, and the fat green frogs with their hoarse banjo-string croaks only sound off once an hour or so. But along with all that lazy contentment are patches of exhilaration and eager preparation, a few towns from here, as the much-photographed hill town of Peacham prepares for its annual "Peacham Acoustic Music Festival." I visited the café at the "four-corners" at the center of the village last week, and half the conversations touched on the festival ... it's coming soon, along with all those musicians. Yet how different this celebration of traditional music is from some other summer festivals that have taken place in the Green Mountains in the past decades: the Grateful Dead in concert; Farm Aid mini versions; years of the Bread & Puppet Domestic Resurrection Circus. 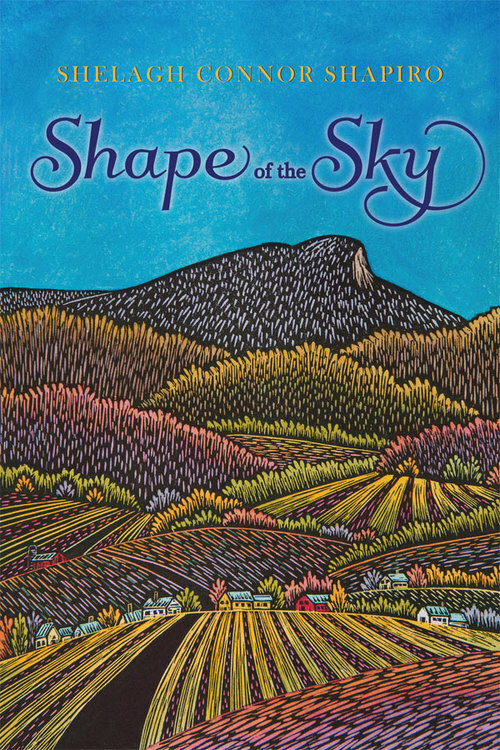 And those are the events and times that Vermont author Shelagh Connor Shapiro captures in her 2014 novel SHAPE OF THE SKY, a gentle mystery in multiple voices. As the book opens, it's late winter, and farmers Georgia and Bill Farnham share impressions during the annual meeting of the tiny Vermont town of Resolute, population 613. When the proposal for the town to host a concert of the state's most famous band (now internationally famous) passes by vote, the Farnhams have their own way of deciding whether to plant the cornfield as usual in the coming spring -- or prepare to grid their field into campsites for the band's devoted followers and thousands in the audience. Two weeks before the festival, there will be a death of a young woman -- a plot twist that's soon revealed -- and Rita Frederick, who's told everyone all along that the festival would be a mistake, will have her satisfaction. But the loss and sorrow of the death resonated more with other characters in the many-voiced tale, in the best of ways: through the love they have for each other and the tenderness with which they view even the visiting band followers, dreadlocks and all. Love, it turns out, is what Shapiro portrays best of all. There's the trusting, solid affection of the long-married Farnhams; the twisted but reliable love of Rita Frederick for her aging father, and his for her; the possibility of romance for wheelchair-bound Becca Akyn and the shifting form of love she has for her son Carter; and in a sense, even the death that takes place involves a young woman uncertain of what her dream of marriage will involve. And, ironically, the long-term affection of the members of the band Perilous Between for each other. 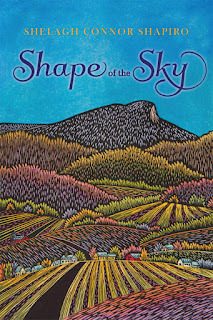 Delicately threaded through the book is Shapiro's image of what village life offers for choices, as the band's concert tour arrives under the name "Shape of the Sky" -- a reference to the way the mountains and trees create the edges of the Vermont sky, but also to each person's separate idea of what the phrase might mean. Don't choose this one for a "mystery" (it's hard to even say whether there's a sleuth here, just a quiet police presence) -- choose it instead for a garden of gentle storytelling that blesses the landscape. The sweetness of the story will linger, long after the plot twists are all neatly resolved and the characters, memorable and unusual, have become part of the good dream of a book well read and well resolved. Published by Wind Ridge Books of Vermont, and available at the usual outlets, especially independent bookstores. Humorous mysteries come in wildly diverse shapes. There are the capers that Donald Westlake gave us, burglars and other petty criminals dashing around cities, slipping on figurative banana peels as they struggle to complete their crimes. There are the very dangerous Stephanie Plum investigations from Janet Evanovich, with the threat of pulling a muscle from laughing too hard at this Jersey Girl's detective work and allies. Not yet well known, but wonderful, are the "Junior Bender" books written by Timothy Hallinan, a cross between a Westlake caper and a heartbreak (no, I won't explain now -- but click here to know more). But there is nothing, absolutely nothing, that compares to P. J. Brackston's marvelous "Brothers Grimm Mysteries" featuring, in 18th-century Bavaria, the amazing Gretel (yes, that Gretel) and her eating-disordered but charming brother Hans, still sorting out their PTSD from that disastrous episode with the witch and the gingerbread house. Gretel is a very successful private investigator herself, weaving deftly among the political realities of kings, princesses, and "Kingsmen" (the police) -- but even with her local background in Jack (the one who planted the beans and climbed the beanstalk) and his family, she's had no preparation for coping with what this particular investigation demands, in ONCE UPON A CRIME. It sounds simple enough at first -- Frau Hapsburg swears three of her cats (among more than two dozen) have been kidnapped and she has plenty of money to pay Gretel to take the case of tracking them down, even rescuing them. But after accepting a hefty deposit, Gretel checks in with a fortune-telling friend who's pretty accurate with a Tarot deck. The mention of a tall handsome stranger in the reading is something she figures is a put-on; it's the mention of a troll that has her worried. Good thinking. I delayed several serious chores, in order to stick with Gretel in her perils. Is the king's executioner really going to take off her head? What was that about torture on the rack? Is that tall, dark stranger really interested in her? And how on earth did Hans come up with some real skills to assist Gretel in her work? She now knew someone was snatching the cats, or, more accurately, having the cats snatched. She knew also that this person lived over the mountains one day hence. Furthermore, she knew that the troll knew who this person was. In addition, she had a rare insight into the life, habits, and singular desires of trolls, but she decided against counting this as a plus of any sort. She had also deduced that the troll was more involved than he was letting on, given the missing finger on the corpse ... the only way to discover the identity of the cat collector was to obtain a human finger and take it to said troll. "Argh!" she cried, as the masseur found a particularly sensitive spot. "Fraulein, you have been overworking these muscles. It is important to build up stamina before attempting any serious activity." Gretel groaned. "Needs must. Besides, I'm not sure what the recommended training would be before encountering trolls." Oh, I know, you're still skeptical. 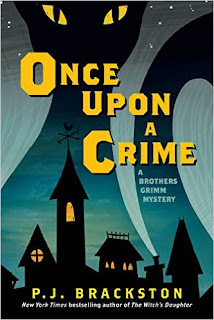 I can't blame you -- if Pegasus Books hadn't started me on Brackston's series with Gretel and the Missing Frog Prints (not a typo) last winter, I might have missed out. This series sounds more than a little crazy, right? But Brackston's books are fun, lively, well-written, inventive -- and they honor all the expectations for a well-knitted mystery, with a great balance of red herrings (or capes, or shoes) and useful clues and entertaining distractions. Didn't you promise yourself that you wouldn't take life so seriously? Here's a great way to start! Sure, I was skeptical at the start -- this is the fifth Athenian mystery set by Australian Gary Corby in "Classical Athens" and it involves a group of actors, as well as the husband-and-wife investigative team of Nicolaos and Diotima. And a ghost! But it didn't even take a chapter for Corby's breezy and quick-paced style to draw me into this 459 BC mystery. And although each chapter brings more revelations about "real life" in Athens and its surroundings, the information is deftly tucked (with smiles) into what Nico and his wife discover. 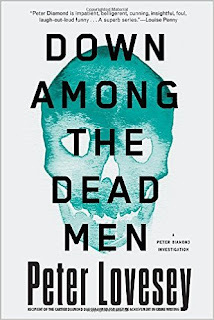 There are some notes at the end of the book, and it turned out that the quirks that most raised my eyebrows came directly from Corby's research (yes, I peeked), so I relaxed and went with this very entertaining and just-complicated-enough romp through murder and mayhem. Anyone who's heard of the way Shakespeare performers refer to Macbeth as "the Scottish Play" already knows actors tend to be superstitious. So it's no big stretch to assume the ones in Ancient Athens would refuse to work if convinced that their performance space is haunted -- especially if accidents keep happening. When Nico and Diotima accept the task of exorcising the ghost in the city's grand theater, Nico at least is matter-of-face enough to rephrase the assignment to himself as "catch the killer," and figure out who's working to sabotage the show before the grand Dionysius festival begins. I tried to estimate the age of Romanos, but it wasn't easy. He was one of those men who could be an old-looking twenty-five or a young-looking thirty-five. There were lines of experience about his eyes, but I guessed that he'd had a hard life and he could have acquired those at an early age. Romanos looked out from our shelter, into the pouring rain. I asked, "Would it help you?" Romanos looked surprised. "Of course it would. Citizens get all the best parts." But what seems to be theater-motivated crime takes a new twist when Nico follows some leads into the surrounding countryside, and sniffs the trail of both beer and wine, as well as scandal. I had a great time reading DEATH EX MACHINA and I'll be scooping up Corby's earlier work, as well. It''s a great treat for summer vacation, and reading the series will fit any time there's good reason to take a break -- for a challenge to preconceptions, a good plot, enjoyable characters, and a sense of fresh discovery. No need to read the earlier books before this one, but I'm sure I won't be the only reader who decides to invest in the whole series! From Soho Crime, and a dandy mix of caper crime fiction and amateur sleuth. 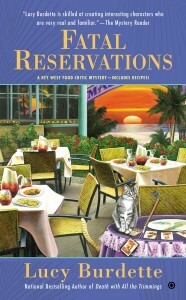 On the cover of the new paperback mystery from Lucy Burdette, number six in her Key West Food Critic series, are many of the enticing elements of this enjoyable summer "cozy" -- Tarot cards, yummy meals, a cat (there are three on the houseboat this time! ), and a fabulous Key West (Florida) sunset. What you don't see in this image though (and by the way, Lucy Burdette, have you thought of producing it as a jigsaw puzzle? the details are darling!) is the tangled situation Hayley Snow confronts as the action opens: her new boss's uncomfortable expectations at the local newspaper (not just urban-level writing style but also classier outfits! ), the prolonged absence and odd reactions of her boyfriend (and old boss), and her uneasy relationship with members of the local police force. In FATAL RESERVATIONS, that relationship is strained by the usual problems facing an amateur sleuth -- the police aren't thrilled to have Hayley snooping into a sudden death that they're labeling murder. Why can't she just step back and let them arrest her fortune-telling friend Lorenzo? But there's another ongoing issue for Hayley as she pulls on her crime-solving heels once again: She's drawn to those smart and decisive characters on the local police force, even when they're trying to evict her from the scene. And having at least one of them decide to be protective of her is making it tough for her to hide Lorenzo in her houseboat home, even with the willing help of her octagenarian housemate Miss Gloria. "I'm sorry we were a bother, Officers," I said. "I'm a friend of Officer Torrence, and he's always telling me, 'Call the police even if you're not sure you need help.' I have a little reputation for trying to do things myself." I pasted on a silly grin and bobbled my head. "You may very well have had an intruder in here," said the big cop, his face looking fierce. "You ladies need to be more careful about locking your door." "We need to get the latch fixed," said Miss Gloria, fibbing so quickly my head was spinning. "It just gave out this week." Miss Gloria also adds great expressions to the conversations, from "case the joint" to "Sheesh" and "Coast is clear." She's a marvelous houseboat roommate, even with her current passion for exploring and talking about burials at the cemetery. But that too may come in helpful. Burdette is clearly on a roll here -- like her most recent two books in the series, Death With All the Trimmings and Murder With Ganache, FATAL RESERVATIONS is tightly plotted, quick-paced, and full of unforgettable characters, dead and alive. Don't wait to get the other books in the series before reading this one. Hayley's interactions and quick recaps fill in what you need to know from her past, and there's so much going on that you might as well leap right into the bay ... err, book. Of course, a big part of the pleasure of this series is the foodie chat, from the meals Hayley is preparing or reviewing, to the recipes packed into the back of the book. This time, the one I want to taste-test is "Once in a Blue Moon Blue Cornmeal Blueberry Pancakes with Cinnamon Butter"; I've just adjusted my shopping list accordingly! Strain lines for Hayley this time around include how to review a less-than-great meal at a new floating restaurant, and whether her printed words could be responsible for the owner's loss of control. I had a lot of fun reading my copy -- which I was delighted to "win" by a drawing that the author provided (thanks, Lucy! aka Roberta Isleib). I won't be able to lend it around the neighborhood, though ... I am still considering another of the recipes in the back! PS - Visiting the Lucy Burdette website is always fun (click here), but I also enjoy keeping up with this author's food chat on Facebook and at the Mystery Lovers Kitchen blog. Hope you'll have a chance to check them out. In the various series of British police investigation novels spinning now, a generous proportion draw their appeal from the team aspect: an investigator we focus on, and a second detective who helps outline the proportions of character and plot. Consider Reginal Hill's Dalziel and Pascoe; you can think of more (and are invited to comment on them here!). Peter Lovesey's reliably intriguing Peter Diamond series, in which DOWN AMONG THE DEAD MEN is the 14th, now leaves behind Superintendent Diamond's pairing with DS Ingeborg Smith, and send Diamond out on a politically risky investigation with his own boss -- Georgina Dallymore, Assistant Chief Constable of Bath, always able to overlook a genuine clue in favor of her own suppositions and her imagined potential fame as a crimesolver. Her obvious certainty that Peter and others find her fatally alluring adds more complication to her insistence that Peter must assist on this hush-hush assignment. (And share a room at their lodgings?!!) And it's soon clear that Peter's not the only one who realizes Georgina is a stunningly poor pick for figuring out whether another city's police force is corrupt. "I don't know about pride," Hen said. ... "I said at the beginning I messed up. You've got your views about policing, I've got mine. What else do you want to hear from me?" "I haven's heard a single 'ma'am,'" Georgina said. "That would be a start." Hen rose to it, as he knew she would. "God help us. Is that what you mean by respect? There I was thinking you were a fellow human being come to listen to my grubby little story when the truth is that you only came to hear me call you ma'am, and I missed all those opportunities. Well, I can put that right, ma'am, ma'am, ma'am, ma'am, ma'am--"
Diamond couldn't let her destroy herself in front of him. "Get a grip." As usual, Diamond's ability to solve the crime -- at first a matter of a body in a trash bag, but soon revealed as much larger and more sinister -- depends on his "read" of the people around him, and in this case it's also a matter of whether he can keep Hen and Georgina far enough apart to prevent open warfare within the force. As Diamond deftly turns the investigation and takes over the lead in spite of Georgina's repeated moves of subterfuge and manipulation, it turns out he is indeed the right person for this one. 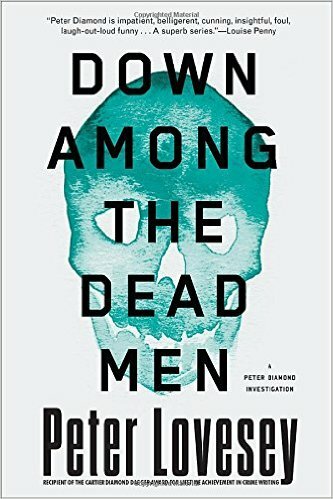 Lovesey and Soho Crime have given us a great summer read, one that will stay on my shelf for midwinter refreshment as well. If you're a British crime reader, this book's a great addition to the collection. In 2000 Lovesey won the Cartier Diamond Dagger for excellence in crime writing -- it's clear he has a long career still ahead. The second tag sale/yard sale mystery from Sherry Harris just came out, and it's a terrific summer read! THE LONGEST YARD SALE follows up on Sarah Winston's debut crime-solving effort in Tagged for Death. Glad to say right away that you don't need to read these in sequence -- because Sherry Harris is a gifted storyteller, with plenty of twists and adventures for her smart and stubborn protagonist. Sarah Winston has one of those jobs that could provide access to things people wish you didn't know -- she's a newspaper columnist. But instead of investigating crimes in her Massachusetts neighborhood, she gives advice on organizing yard sales, and her column's popular enough to run in both the local paper and some of the others around. Of course she checks out plenty of sales herself. Her eagle eyes catch some great bargains, as well as solid fixer-uppers; she's been a cash-strapped military wife, and now she's cash-strapped and divorced, so she's well motivated to make the most of her expertise, even consulting for a fee for those who want the best sales. As THE LONGEST YARD SALE opens, Sarah's donning an earpiece and microphone to keep her in touch with her boss-for-the-day, town manager Nancy Elder. 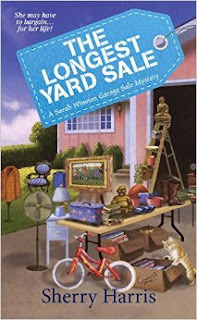 Sarah's own casual suggestion about a way to draw tourist attention to the town of Ellington, Mass., by throwing a record-breaking "New England's Longest Yard Sale," not only caught on with Nancy and the town leaders -- it got Sarah the job of coaching the sale into existence. Now it's time to see how the town's already narrow roads will handle the influx of shoppers for the day! And that's raising the tension for Sarah too, because the police force struggling to manage the surge of traffic and tourists is headed by her ex, now the police chief -- and he's willing to blame her for problems, while at the same time expecting her to get back together with him, since in the previous book (no, I won't spoil it!) she's had to admit he's not as bad as she thought. And she clearly still cares about him. Still, she's got other possibilities, very pleasant ones, if also confusing! If you're a fan of "cozy" mysteries -- the traditional small-town ones where the characters usually have known each other for a while, and life's frictions begin to add up to "I wish that person were dead" -- the quick piling up of suspicious circumstances in the first few chapters here will be like a candy store of goodies to choose from: the demanding and sometimes missing-in-action town manager Nancy Elder; Sarah's two suitors; the wealthy town resident who asks Sarah to appraise her things for an estate-type sale but also is clearly hiding things and circumstances; and the small but dangerous crimes that arrive during the yard sale itself, from arson to theft to threat. Turn off the phone, make a tall cold pitcher of iced tea, put your feet up -- or if you indeed pack this one for the beach, take a good swim BEFORE you open the book. It's lively, quickly paced, tense and twisty enough to keep the pages turning eagerly, while being very much about women, their friendships and life paths, and how they work out problems that are scary and intense. There wasn't a single point in the book where I felt like putting it down! Harris proves that her first good book was the start of a strong series, by adding THE LONGEST YARD SALE. Sarah Winston is starting to feel like a friend "from away" who just can't stay away from investigating for her neighbors and trying to find justice for them. I can hardly wait for the next book -- Sherry Harris (with Kensington Publishing) clearly will give us more good reads for summer and other vacations to come! A little local note: Last summer my neighbor Marsha and I collaborated with some of Marsha's friends to hold a fund-raising yard sale for her dog Abby, who needed help to resume walking after an accident. This year Abby's doing well -- thank you all! -- but Marsha's loyal laying hens are in trouble for liberating themselves into the garden, and a couple hundred dollars of more secure fencing are needed, to prevent "the girls" from being turned into Sunday supper. So ... you guessed it ... we're prepping for another yard sale. I'm keeping track of the tips that Harris's books offer in the text and at the end. Onward!